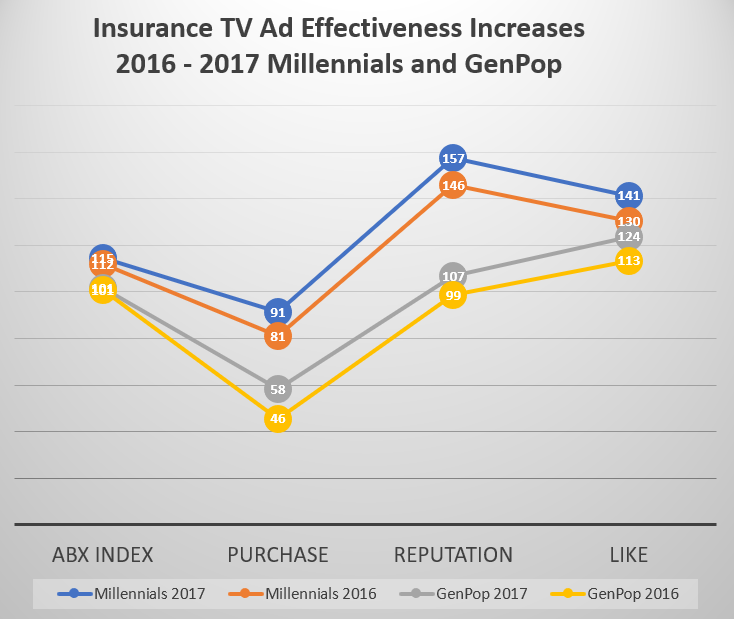 In late 2015, Farmers Insurance and Allstate had the best TV spots for reaching both Millennials and GenPop together. Today, we fast-forward into the future to see how insurance advertisers have done against both audiences for 2016 and 2017, and how advertising effectiveness has improved in a big way! It is not unusual to see much higher Millennial scores than GenPop across many categories, so we're not sure how much of the differences above are unique to automobile insurance. Certainly those who say Millennials don't respond to advertising may not have all the facts. What is more important is that within each demographic, there is positive growth year over year. So insurance advertisers should be encouraged with such positive scores from both audiences over the past two years. What makes insurance advertising good? The top five spots below highlight what's working and for whom. This crazy "chauffeur terrier" :30 spot scored an ABX Index of 143 from Millennials and 125 by GenPop - both of which were the top scores in each demographic. 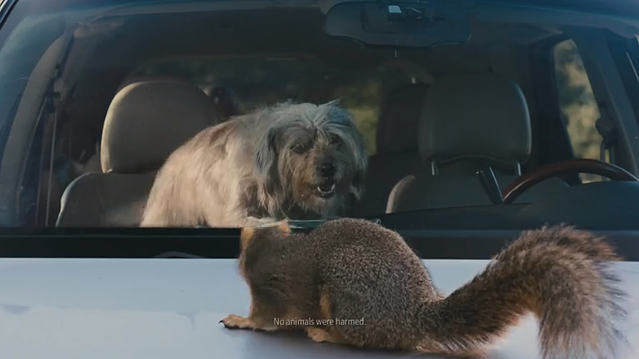 The spot shows a squirrel jumping in front of a car window, which freaks out the dog inside, which jumps in the driver's seat, drives across a golf course and crashes into another car. The point is, Farmer's covers everything - even dogs driving cars that crash into things. The spot has very high KPI scores including: Likeability =184; Message =134, Reputation =167 and Intent to Contact the Company = 224. This is hysterical. After running out of gas in the middle of the desert, the driver allows no one to say a word, but quietly texts Geico Roadside Service. Gas is delivered, also without a word. "Some things are easier done than said." You gotta see it. Scores: ABX Index = 137; Message = 141; Reputation = 186; Likeability =190; and top CTA's are Contact the Company = 227; Search the Web = 165; Recommend = 260 and Talk About it = 230. This :30 spot starts out like all Liberty Mutual spots with people giving testimonials in front of the Statue of Liberty. 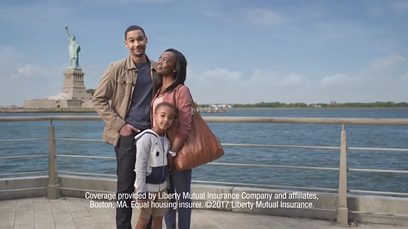 In this case, an African-American father talks about how his family now saves $800 a month through Liberty Mutual. 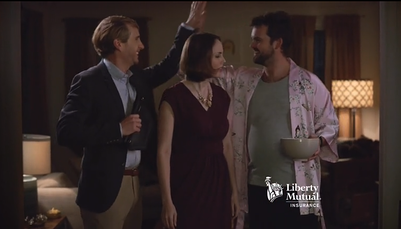 The spot turns humorous when the mother of another family gets jealous of these savings and goes off on her husband and his brother - who happens to be wearing her robe. This spot ties Geico's at an ABX Index of = 137 with Likeability at 174 and Reputation at 252. Even more notable are the CTA scores: Contact Company = 236; Search the Web = 175; Purchase = 163 and Recommend = 250. 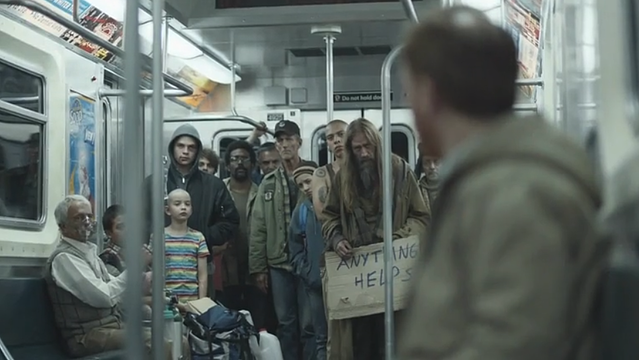 This :60 spot from State Farm visualizes a man in various life situations, confronted by people, animals and things that need his help in some way. The message, "You can lift the weight of caring by doing," includes a URL for signing-up to volunteer. While the spot scored high for GenPop at 129, it suffered a little in Brand Linkage at 96. However, Reputation was strong at 239; it was well-liked at 182; and CTAs included - Contact Company = 251; Go to the Web =174; and Talk About it = 236. For an image spot like this, it is not surprising that Purchase Intent was only 56 since that was clearly not its intent. A high Reputation score was the most important result. 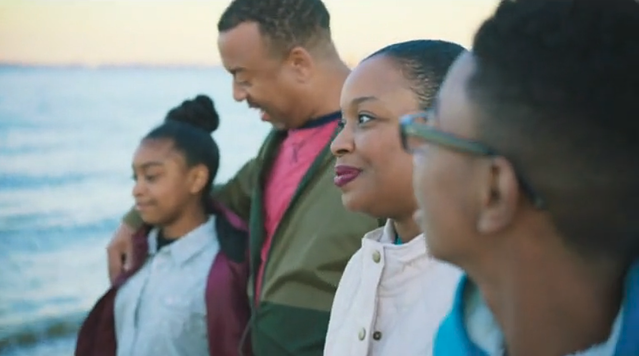 In this results-oriented USAA spot, GenPop seemed to respond well to the straight-forward message of "peace of mind." The spot highlighted a military family who had suffered a five-day power outage resulting in massive food spoilage. USAA met their claim in full. This :15 spot tied with the State Farm ad above, scoring an ABX = 129. Specific scores included Reputation = 212; Likeability = 141; Recommend =155; Talk About it = 137; and Go to the Web = 121. 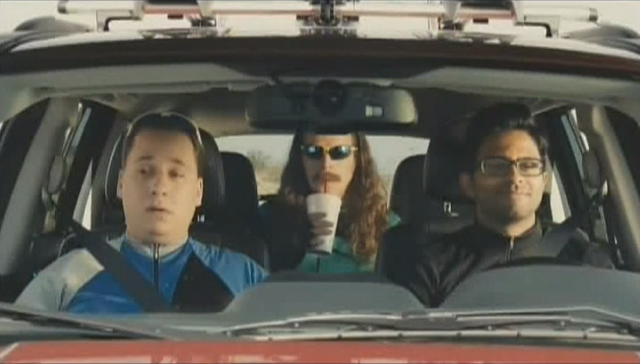 As with State Farm, this spot had low Purchase Intent of 59, but a very high Reputation, which was in line with what appeared to be campaign objectives. Congratulations to Farmers Insurance, Geico, Liberty Mutual, State Farm and USAA for great creative work in 2017. If you are interested in competitive intelligence in advertising for other categories, take a look at our Resources tab here. Are you satisfied with how you are measuring advertising effectiveness? Is it resonating through Awareness and Message, and having an impact on Reputation and Action? ABX provides the largest normative database in the industry across all media types. On average you can improve your creative effectiveness by almost 20%. If you have questions, or would like a quick, informal chat, please click here. Free eBook: "Four Key Performance Indicators to Decrease Advertising Investment Risk and Build ROI"
Written by ABX President Gary Getto, this brief eBook shares insights gained from the world’s largest database of benchmarked ads. You will learn the characteristics of powerful advertising and how it can better drive results through real-life examples. ABX provides ad effectiveness scores from human respondents against 14 variables and in all media types. ABX Index values are a comparison of the results of an ad versus the average of all ads in the ABX database (135,000+ ads). Click for more information about definitions and methodology.